It’s been a long busy couple of weeks for us. 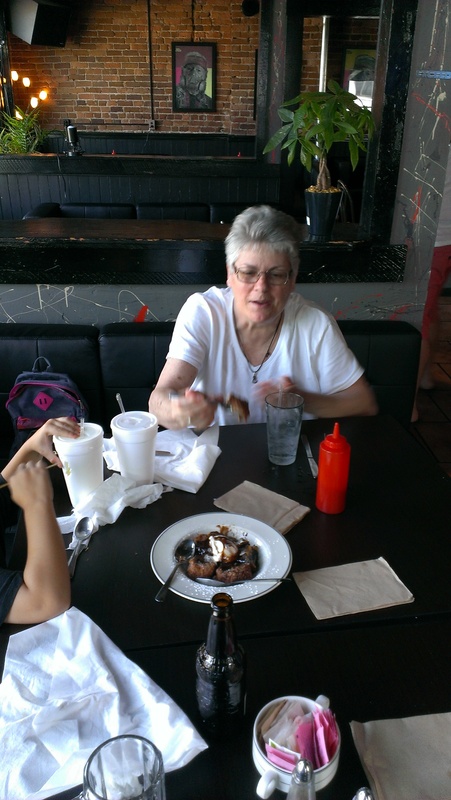 After we left Colorado we drove down to Arkansas and picked up my mom from Little Rock. She flew in for a short vacation and to drive up to Indiana with us. On our way back from the airport we stopped in Hot Springs to grab a late lunch. 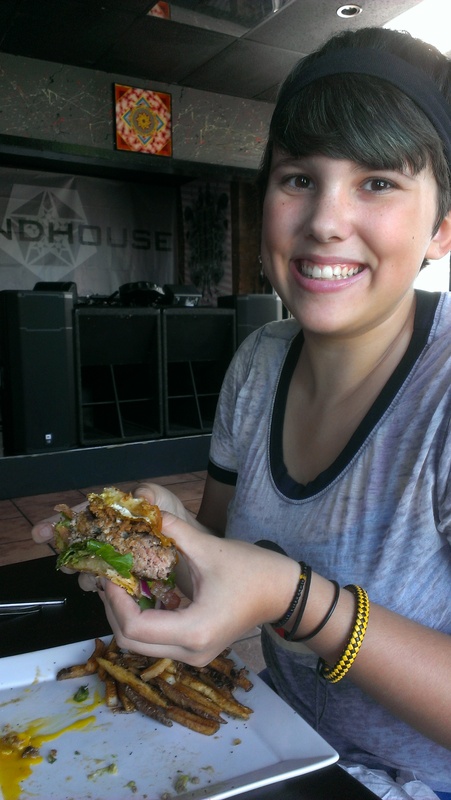 Being that Yelp is my best friend, we listened to the reviews and decided on having burgers at the Grindhouse. They have taken the honor of being named the TravellingAwesomes best burger joint! It’s a laid back joint with a full bar, full menu, and late night beats and eats for the Hot Springs crowd. It’s the kind of place that tells you to bring your kids…but remember to come back later after you put them to bed for the over 21 entertainment! Anyway, we were greeted by a nice outside area up in the penthouse of a downtown building. Once inside, Vanessa greeted us with a smile and a wave to sit anywhere. 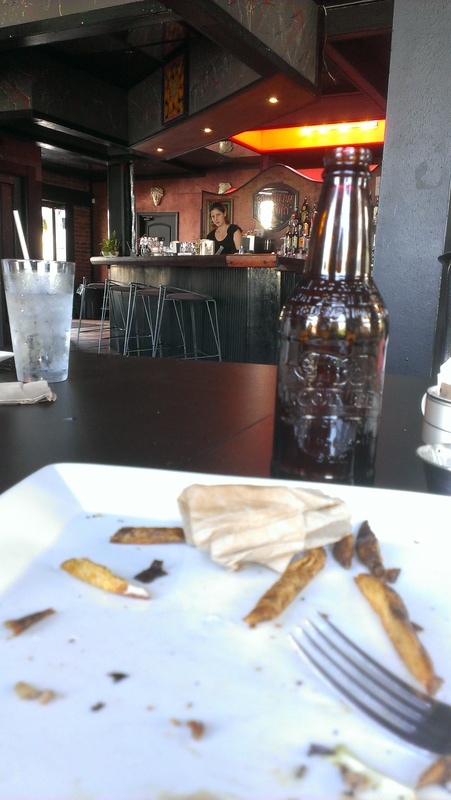 We liked the vibe, and her, right away….which always is important….atmosphere and presentation is important! The menu isn’t large, but it’s still full of choices….hard ones…the combination of burgers available made it difficult to choose because I’d have loved to try them all!! 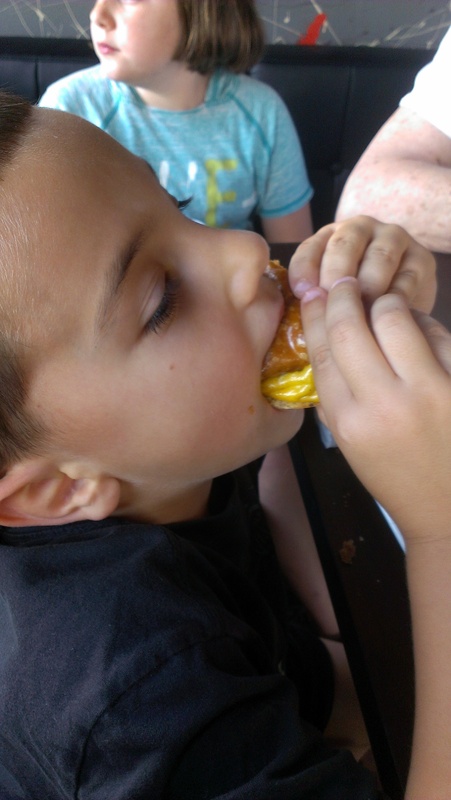 We settled on a Reuben, and two burgers for the big people, and a plain cheeseburger for the boy (which wasn’t on the menu but they were happy to accommodate). Burger #1 was the El Chapo: burger stuffed with colby jack and chorizo, topped with lettuce, tomato, onion, avocado, a house made lime chipotle spread and a fried egg. 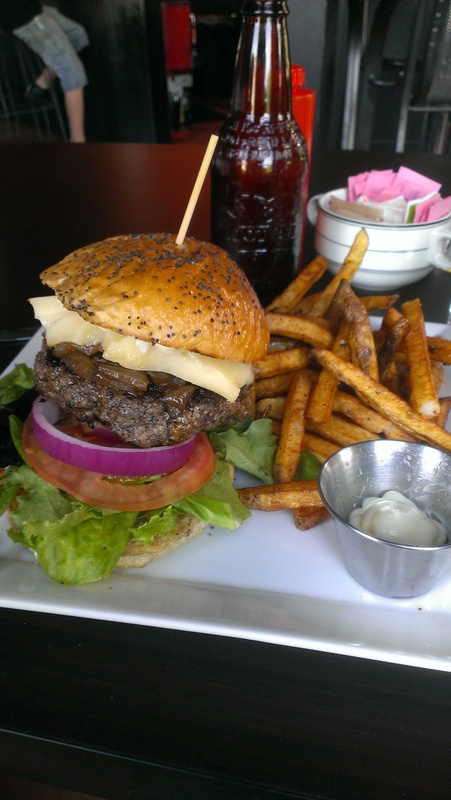 They serve their house ground burgers (made with brisket and chuck) with some fresh, FRESH, cut french fries and a Truffle Aioli sauce…..of which I was simply compelled to ask for seconds! 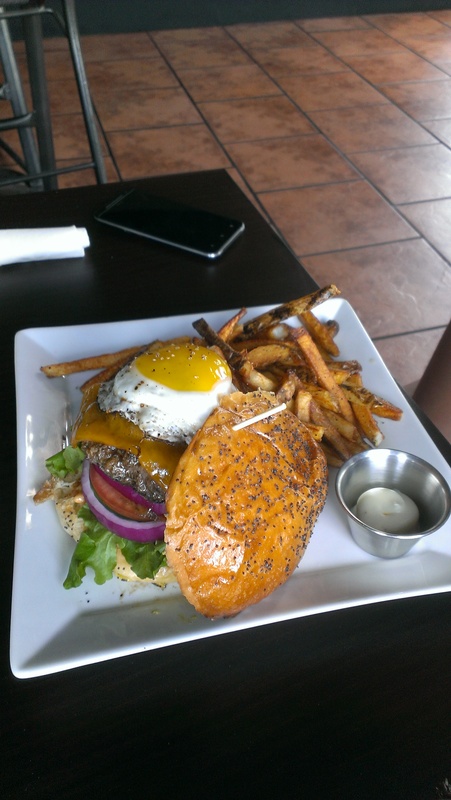 I cannot explain in words how GOOD these burgers were. Moist, bursting with flavor, and paired with the perfect fry and dipping sauce. You know, it’s not often you find a place that serves a great plate. Most places have one thing that stands out and the rest is left in the dust, leaving you feeling like they just threw it on the plate to fill in the empty space. 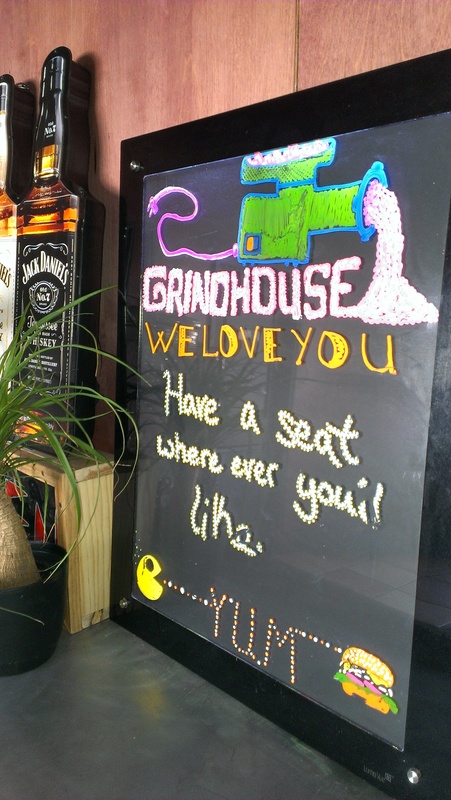 Grindhouse took the time to figure out great recipes for each and every item that was served to us…and it showed. They should be proud, it was a great meal. 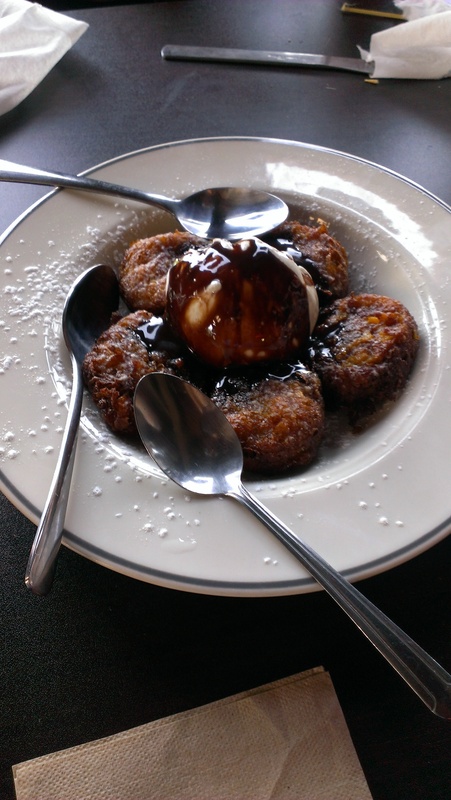 Now, after filling up on these burgers, Vanessa convinced us to try their deep fried Oreos….in my mind I was think about my friend Lauren and her sister, Jamie, who always hit the NC State fair with the intention of trying whatever is new on the indulgence list…last year was deep fried everything! 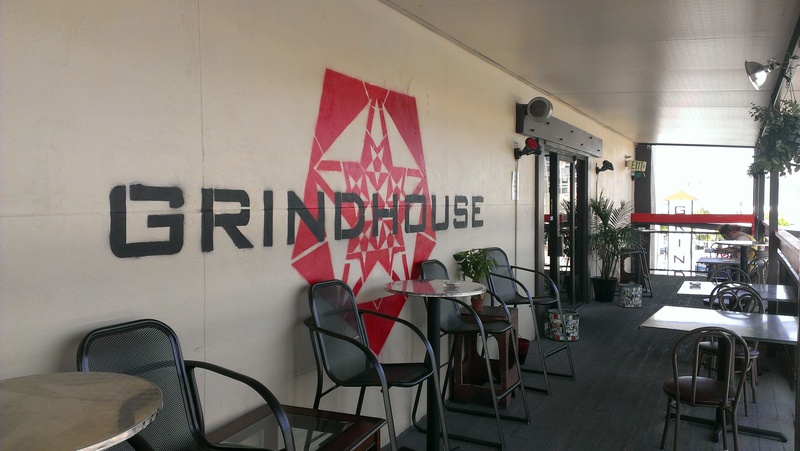 They, as we expected, were on par with the quality and taste we found at the Grindhouse! Here are a few more shots we took while there…. So, we tried, we conquered, we left wishing they had curb side wheelbarrow service! I’m emailing Diners, Dive’s, and Drive-Ins. The Grindhouse totally needs to be on that show!